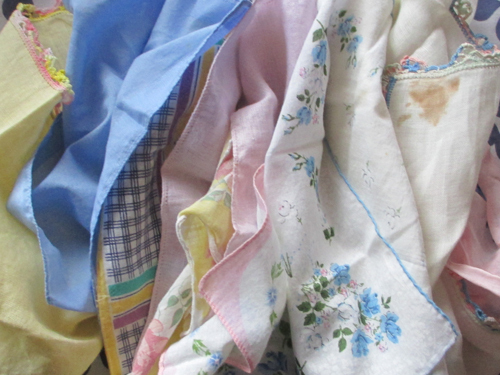 Of all vintage linens, I think hankies must have the best stories. Just think about it – tucked into pockets and purses they went everywhere, while other linens – towels, sheets, doilies – were relegated to bed, bath, and dining rooms, or stayed hidden in linen closets and cedar chests. For years I’ve been toying with the idea of putting them on display, but how? and where? There’s not much room in my cozy cottage. Then there was Pinterest…. so many ideas! (If you don’t know what I’m talking about, go to www.pinterest.com and type “vintage hankie” in the search box.) I finally settled on a scarf… meanwhile, the handkerchiefs waited in their box until I went looking for my box of vintage gloves in search of a pair to wear to a Mad Men party earlier this month. Right about that time Betsy at Indygo Junction asked if we’d like to participate in a pattern give-away… which coincidentally included a pattern for vintage hankie scarfs. 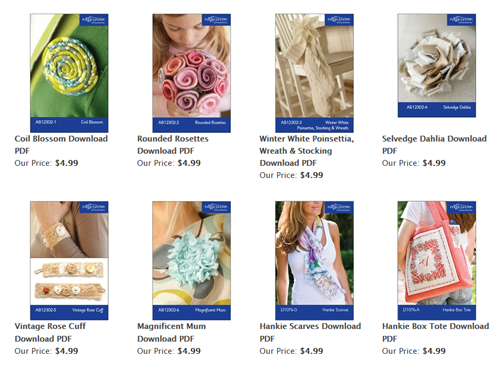 Hmm… it’s almost Easter and I have nothing to wear… I think it’s time to make that scarf I’ve been planning, don’t you? Step 1) Read through the instructions; I decided on the long scarf. Step 3) Audition hankies to see which play nicely together. I had about the same number of prints and solids, so mostly alternated between the two and then wrote down the sequence so I wouldn’t forget. Step 5) All of my hankies were in good condition except one… a lace-edged linen square with a big dark stain in one corner. I hadn’t been able to remove it when I tried in the past, so with nothing to lose I decided to try bleach gel. What’s the worst that could happen? It might dissolve the linen as well as remove the stain. I applied the gel and the stain got a little lighter… I left for about 20 minutes and checked again. The stain was nearly gone! Alas, so was some of the linen. 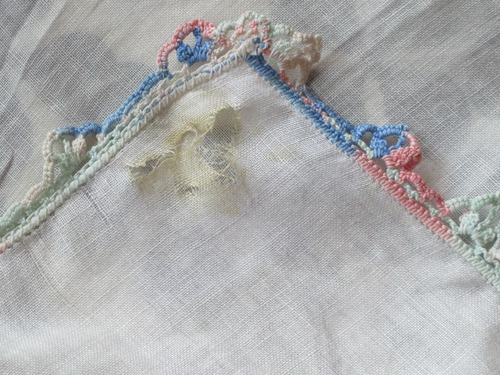 So back to plan A: Remove the lace from that edge, trim away 2″ of linen, then reapply the lace when I join the hankies. Step 6) Read the instructions again and put the scarf together. To match the fine hankie fabric I used Mettler 60-weight cotton embroidery/darning thread in the needle and bobbin, with a size 70 Universal needle (a Microtex Sharp would have worked well, too.) For my presser foot I selected one of my favorites – Clear Foot #34 – as it has a flat sole for holding the fabric layers in place, but because it’s clear I was able to easily see where my hankie edges overlapped. And here is the finished scarf! Lots of options for incorporating it into my spring/summer wardrobe. 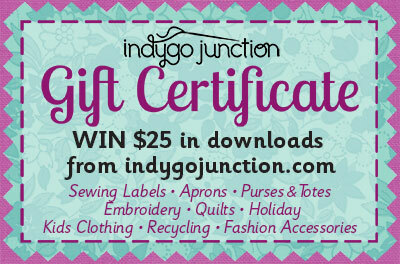 In addition to the Hankie Scarves pattern I used, Indygo Junction has over two dozen other downloadable e-patterns available, including more vintage hankie and notions projects. 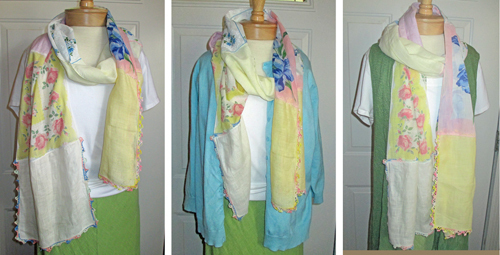 I’ve used vintage linens to make clothing, accessories and keepsake items. My favorite item from vintage linens is a pieced top that I made using a combination of scarves, sheets and a lace tablecloth. I have actually cut – yes cut apart hankies and made them into quilt blocks – fan shapes are a good use. You can also use the fancy edges as the centers for crazy quilt blocks. OOOO missed the contest….who won??????? ?